Other factors that may influence the adoption of alternative fuel vehicles, and specifically electric vehicles, include . . . our capability to rapidly swap out the Model S battery pack and the development of specialized public facilities to perform such swapping, which do not currently exist but which we plan to introduce in the near future . 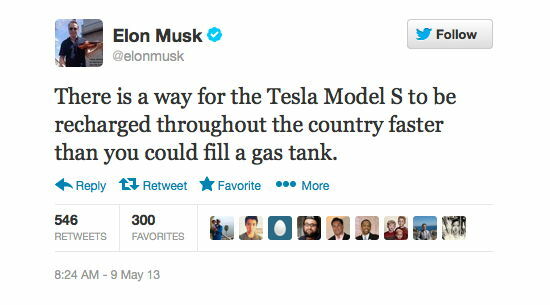 . .
Perhaps Tesla's also cooking up a new scheme for how to buy the car? You buy the car but not the battery. You pick out your Model S the way you want it, and then you "lease" a battery. So suddenly the price of the car drops from say $85,000 to say $45,000 or $50,000. And you essentially have a "subscription" to batteries, which you can recharge on your own at home or at any of the growing number of places including Tesla SuperCharger stations, or, you pull into one of the swapping stations and just swap it out for a quick in-n-out change. Which makes me think Tesla ought to cut a deal with In-n-Out Burger. You drive in, get your food, and they ask, in addition to "would you like fries with that? ", they ask, "would you like a fresh battery with that?" The next month or two are gonna be interesting . . .